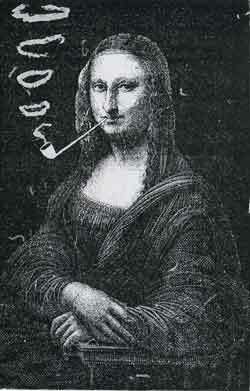 Sapeck's "Mona Lisa with a Pipe" (1887) is emblematic of the attitude that is the "Spirit of Montmartre." The attitude is fumisme, used to name the mocking humor that characterized the cabaret scene of bohemian Paris. The anchoring term is the verb fumer (to smoke), but with a usage in agriculture, "to manure." A fumiste is chimney sweep, with slang extension to name a joker, crackpot, fraud. A "wit" is different from a fumiste, a distinction used to clarify the intent of Sapeck's illustrations. Whereas the former made fun of idiots in terms that they were not always able to understand, the fumiste accepts the ideas of the idiot and expresses their quintessence. . . . The fumiste avoids discussions of ideas, he does not set up a specific target, he adopts a posture of withdrawal that makes all distinctions hazy, and he internalizes Universal Stupidity by postulating the illusory nature of values and of the Beautiful, whence his denial of the established order and of official hierarchies. From this point of view, which is that of the sage, the dandy, the observer, and the skeptic, everything has the same value, everything is one and the same thing (Daniel Grojnowski, in The Spirit of Montmartre: Cabarets, Humor, and the Avant-Garde, 1875-1905). This particular image helps specify the context of Routine as a concept formed to function within the apparatus of electracy. Our argument is that Paris is to electracy what Athens was to literacy (in general). The cabaret is the "Academy" of electracy, and this analogy between cabaret and academy may be developed extensively to define a template for an image metaphysics (the analogy guiding this project). Cabaret entertainment institutionalizes and provides material support in the new conditions of "Street" for the invention of a new seat (see) of culture. The equivalent for literacy is the attitude of questioning, of materialist mathematics, that evolved into the scientific method and the whole Gestell of utilitarian techno-science over the historical life of literacy. An immediate point of interest is the background that Sapeck's Mona Lisa provides for Duchamp's more famous readymade (the mustachioed Mona Lisa), composed much later. The curious might wonder about the choice of iconic image to profane, and one latent connection is indexed in the term fumisme. The hazy smoke associated with this attitude resonates with one of the important terms used to identify Leonardo's style: sfumato. Some other associations to be developed further: That the emergence of cabaret arts in late-nineteenth-century Paris was done explicitly in opposition to the official "Academy" of art. A question: is the fumiste pose a dramatization intended to bury the Cartesian version of selfhood and subject, whose conceptual persona is the idiot (as D&G explain)?